The term déjà vu is French and means, literally, "already seen." The odds of a school making it to the state football championship game in back-to-back seasons is pretty slim, especially the odds for two teams to meet for a state title in consecutive seasons. Welch Stadium in Emporia will be packed on Saturday afternoon as Blue Valley North (9-3) will face Derby (12-0) for the 6A state title for the second straight year. Blue Valley North defeated the Panthers 49-42 in an offensive shootout 364 days prior to the 1 o’clock kickoff on Saturday. It’s a game both coaches have memories of in their head. Derby will make the 90-mile drive on Saturday morning with the hopes of finishing the season with an unbeaten record and a state championship plaque to cap it off. The Panthers have dominated their opponents this season, outscoring them 554-87. Derby’s offense has put up some big numbers this year and are averaging 46.2 points per game. According to Sims, this Derby team is extremely good. “This is head and shoulders, without a doubt the best offense, defense, kicking game team that we will have faced in my time as a head coach,” Sims said. The fact that the Panthers put up over 46 points a game may be impressive, but it’s the Derby defense that has caught the attention of people across the state all season long. The Panthers stout defense is giving up just 7.3 points a contest. The most points the Panthers have given up in a game is 21 back in week 8 against Maize. The Panthers defense will have their hands full with the high-powered Mustang offense led by Wisconsin-commit and 6-foot-4 205-pound quarterback, Graham Mertz. Mertz has thrown for a state-best 3,651 yards and 49 TD’s. He has had a plethora of receivers to throw to the past few years, but his main target has been Cameron Burt, the senior has 95 receptions for 1,705 receiving yards and 20 touchdowns. The 1,705 receiving yards is already a new Kansas state record and he’ll try to add on to that on Saturday afternoon. Burt is within reach of the single-season state records for receptions (98) and touchdown receptions (23). The explosive Panther offense has been led this season by Hunter Igo at quarterback and Tre Washington at running back. Much like last season, Igo began the season as a defensive back, but moved to quarterback after an injury in the Bishop Carroll game. According to Clark, Igo is one of the best leaders he has coached in his tenure with the Panthers. Derby has had no problem getting through the 6A west playoffs. The Panthers defeated Lawrence, 41-7, Dodge City, 54-7, Topeka, 38-7 and Manhattan, 24-6. The Panthers will leave the Derby city limits on Saturday to play a game for the first time since Oct. 19 when they played at Maize and won 35-21. Since then the Panthers played four straight games at Panther Stadium in front of a packed house. Blue Valley North has played in some closer games in the 6A east playoffs, including a thrilling 51-49 last Friday night over Olathe North. Mertz threw for 527 yards in the win over the Eagles and also added five touchdowns. The Mustangs have defeated KC Wyandotte, 68-12, Shawnee Mission South, 56-21, Gardner-Edgerton, 49-28 and then Olathe North to reach Saturday’s state title game. 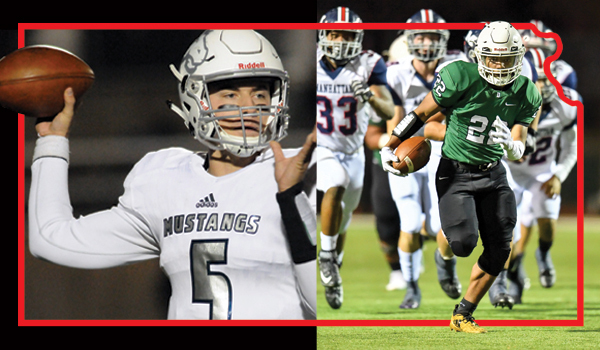 The Mustangs started the season 0-3, but have won nine straight games and are averaging 53 points a game in the current nine-game winning streak. According to coach Sims, this is a completely different team than they were in early September. The Panthers have built a legacy under head coach Brandon Clark. Clark took over in 2006 as the head coach after the Panthers went 0-9 the previous season. Since that point Clark has put Derby back on the map in quite the fashion. On Saturday, Clark will have taken the Panthers to the state championship game for the fourth straight year, having won two of the previous three. The Panthers have won three state titles under Clark, 2013, 2015 and 2016 and have won 48 out of their last 51 games in the last three-plus seasons. They still haven’t lost at Panther Stadium since the 2014 season in the playoffs to Hutchinson. Andy Sims remembers the day he took over the Blue Valley North head coaching job back in 2014. The Mustangs had won just one game in the previous three years and were considered a “laughing stock” in the Eastern Kansas League. Sims guided the Mustangs to a 2-7 record in his first season and that win total has only gone up ever since. Saturday’s game should be a barn burner no matter what. The Panthers will have basically half of their defense back from last year’s state runner-up team and a few offensive guys back that played key minutes last November. Derby had a lot of guys injured for last year’s game that are healthy for this coming Saturday and that has coach Clark excited for their chances. The Mustangs had to replace 35 seniors from their team a year ago, but the fact that Mertz is back is a huge plus for them. The question will be can the Mustangs offense put up the points needed to win against this great Derby defense. The question will be answered on Saturday afternoon.